At the beginning of the game, move towards the center of the board in order to take up a maximum amount of space. If you remain confined to the corner you start in, you will not be able to put down many pieces. Try to place the largest pieces on the board at the beginning of the game. If you save them for the end of the game, there may not be space for them. Keep an eye on the corners of your pieces-make sure you have options for your next move. Don't forget that one of the most important elements in the game is the position of the corners of your pieces on the board, which gives you the opportunity to extend your game. Each time that you place a new piece on the board, remember that you must multiply the angles available, which will then allow you to develop your new strategies. You will very quickly be able to identify strategic points of passage in your opponent's lines. These are doors which can open up new territories for you. Be the first to try to capture them because only one player can use each of these doors. Take advantage of the characteristics of your pieces. Their shapes give them different offensive or defensive potential, so learn to use them accordingly. Patience is a cardinal virtue! It is sometimes profitable to hang back slightly from your opponent's pieces to lead your opponent to expose himself/herself. This will allow you to then block him/her more effectively. Remember that each attack can be met by a counter-attack which can stop your piece and even make it totally unusable afterwards. Think of the game of fencing where the person who attacks first is not necessarily the one who marks the point. In the course of a game, you will sometimes notice squares or entire areas where only your pieces can be placed. Keep them in reserve and concentrate your energies on another combat area. You can always place these pieces at the end of the game. Throughout the game, keep one or more means of escape on each side of the area containing your color (or colors). Play according to your remaining pieces, but also according to the remaining pieces of your opponent. An empty area can be unusable by your opponent if s/he does not have the required piece that would allow him/her to reach it. The "little" piece, or the single square, is an essential weapon because it can always open up a new area in the course of the game (and it is the only one in this case which can never be blocked). But this key is …. unique ! You therefore need to resist the temptation to use it too quickly. And don't forget that if you manage to place it on the board last, you will receive bonus points that will probably make all the difference. Block your opponent by covering his or her most advanced corners to prevent him or her from moving forward. Note: Be patient-it is sometimes better to hang back slightly from the opponent's pieces and let your opponent expose him or herself so that you can then block him or her more effectively. Remember that finishing a colour earns you 15 points, or even 20 points if you finish with the single square. Check if your opponent will be able to achieve this, and if this is the case, try to imagine how you can prevent him/her, even if this means sacrificing one of your pieces. Try to place your large pieces on the board at the beginning of the game. In fact, the further the game progresses, the more the space is reduced and it will be increasingly difficult for you to find a place available for them. Notice the squares or the areas where only your pieces can be placed. Keep them in reserve and concentrate your energies on another combat area. You can always place these pieces at the end of the game. 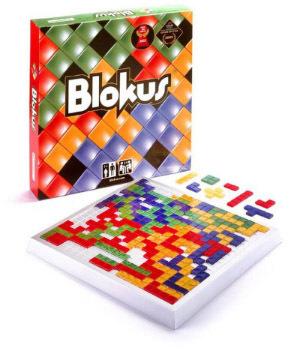 In Blokus Duo, the best attack is the counter-attack (or defence). Because of the small size of the board, it can be quite easy to quickly create an area where you are the only one who can play. To achieve this, it can sometimes be interesting to allow your opponent to (apparently) call the shots. But for each piece s/he places on the board, your only concern will be to prevent him/her from moving in the direction of your "camp", which will slowly take shape. If you achieve this, well done! All you will have to do now is to penetrate into his/her area (because of course you will have had the presence of mind to keep an escape door open in your impassable wall). Beware of some of the pieces! 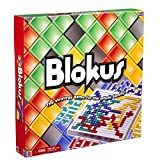 Even more than in the other versions of Blokus, you will quickly identify the 2 or 3 pieces that are extremely difficult to place on the board at the end of the game. Because they are so cumbersome, if they are placed at the end of the game they can even freeze spaces which will be painfully lacking afterwards. 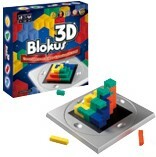 Try to place the complicated "3D" pieces at the beginning of the game and keep the small ones for the end when it will be more difficult to place pieces. Remember that each piece you don't place reduces your score. Throughout the game, place your pieces in the central area. In that way you always have many possibilities to place additional pieces and you avoid getting locked in a corner. When playing, keep in mind not only your own remaining pieces, but also those of your opponents. Near the end of the game, the other players may not be able to place a piece if they do not have the correct pieces. 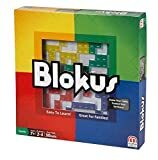 The specificity of Blokus Trigon is that the pieces are composed of triangles… of up to six elements. Make sure you keep this particularity in mind and when you are examining the board, don't hesitate to count the triangles available on it to check whether the area you have your eye on is adequate. The strategy is different according to whether you are playing with one or two colours. With one colour, try to spread out rapidly and not let yourself be shut into one area of the board. With two colours, take the initiative: try to shut in your opponent by using your two colours. If you succeed in blocking him/her, you will have more room to place your own pieces. Each time that you place a new piece on the board, think of the possibilities for later passages. Note the points of passage in your opponent's lines which can open up new territories for you. Don't forget that three colours can go through the same intersection. Construct your conquering strategy methodically. It is very easy to place your pieces on the board in the first half of the game but the board then fills up very quickly and the possibility of placing your pieces rapidly decreases. Don't use your little pieces too quickly. They allow you to open up new areas in the course of the game but these keys are unique! So make sure you resist the temptation. Players who put all their pieces on the board can gain up to 20 points. Prevent your opponent from putting all of his or her pieces on the board even if this prevents you from placing some of your own pieces on the board. Remember that finishing a colour earns you 15 points, or even 20 points if you finish with the single triangle.